“I am more comfortable with my race,” said Samara Figueroa, a minority student, who was walking down the Penn Manor High School hall recently with another Hispanic student and friend. Like many Hispanic students at the mostly white Penn Manor High School, Figueroa hangs out primarily with other Spanish students. She said, as do many students, people prefer to hang out with members of their own race. But they insist that doesn’t make them racists, although they are very aware of their differences. 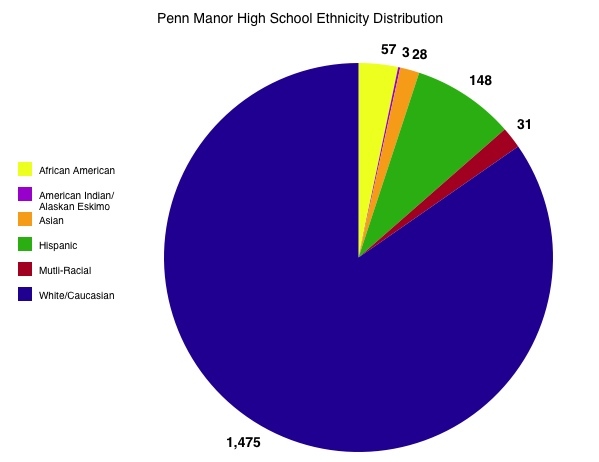 Even though the number of minorities in Penn Manor School District rose from 13 percent in 2008 to 17 percent in 2011, the minority base in the high school is still that, a minority. Nearly 85 percent of the high school student body is white. Nine percent are Hispanic, three percent are black, and two percent are considered mixed race (not Hispanic). Two percent of the student body is Asian, and three students are Native American. Whether it is because of a comfort zone, fear or it is just an easier way to relate, the minorities and whites at Penn Manor seem to have their reasons to be naturally attracted together in the halls, classrooms and in the cafeteria. Different races do different things from handshakes, slang and fashions. One of the main reasons the students don’t often socialize outside their race, they say, is because others sometimes don’t understand or relate to their culture. Another common sentiment was that people also tend to reach out to only their race because people feel more comfortable talking to someone when they have something in common with that person. 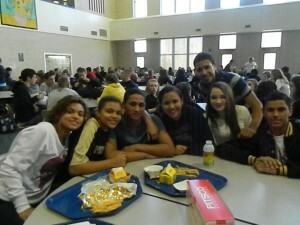 One place where the students overtly congregate by race is during lunch in the cafeteria. An entire table of black students and another of Hispanic students stuck out in the bustling, mostly white Penn Manor cafeteria this year. A book, titled Why Are All the Black Kids Sitting Together in the Cafeteria?, says this phenomenon is called self-segregation. “It’s not the same when you’re not with the people you’re with all the time. It’s okay ’cause they get your jokes and everything, but other times they are just out of it,” said Gladdy Clay, a minority student. Students said there are obvious divisions or cliques in school, often along racial lines. And they said it a lot. Penn Manor students were quick with their opinions about the race divisions in the high school. “I get nervous being around the other minorities,” said Mark Conrad, a white student. “We pay attention in class. We don’t pay attention to other people that don’t want us here,” said one Penn Manor minority student. To some students racial cliques seem impenetrable unless you have the right colored skin. This can be tough for new students at Penn Manor. “Some rednecks act immature. They click their boots loud and they give you that look, but we don’t come at them for being white,” said a student at Penn Manor who wished to remain unnamed. “Sometimes it’s a little frustrating because, like, everybody acts differently because different cultures act in different ways,” said another Penn Manor minority student. “In a (white) majority school district, black students and Hispanic students will sit together out of a feeling of comfort and some will also say there are somethings my white friends can’t understand,” said Quay Hanna a Penn Manor club leader, activist and author who gets kids talking about racial issues in an effort to ease tensions. When you first meet someone, you don’t know if that person has anything in common with you. Color is something that is apparent at first glance. If you are the same color it gives that person a natural comfort zone without even greeting each other, some experts say. Communication is a part of life and sometimes inter-racial communication can be a huge hurdle, affirmed Hanna. “I felt really weird just hanging out with a bunch of black kids and being the only white kid there. Sometimes I don’t understand what they are saying,” said Hecker. Many students at Penn Manor haven’t been put in the situation of being the minority and have trouble dealing with the thought of being different. “I was in a class with a whole bunch of rednecks, and I was like hell, no. 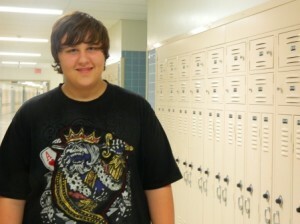 I am getting out of here, so I switched classes,” said a Penn Manor minority student. The minorities at Penn Manor go through this everyday and it can be extremely stressful for some. Some minority students feel like they aren’t welcome in a group of white students. “Were just being us. They think we are loud but were just being normal when a white person is loud they are called normal but if were loud were called ghetto,” said Jarkysha Jones. It can be tough to be a certain color and come to a school where you’re not the majority race. “I ask white students if they went to a Philly school…how would they know where to sit when you enter the cafeteria. Even the white students might not always be like you,” said Hanna. It is hard to think that students believe that if you are of the same ethnicity that you will have things in common or will be easier to get along with, but it is unfortunately true. “We’re not here for everybody else, we’re here to learn,” said another Penn Manor minority student. But racial tensions here at the high school are not interfering with education, most students agreed.